Whether you are a complete novice or have some martial arts experience already, we would be delighted to welcome you to a free first training session. You will be able to experience the class basic training and watch our senior grade students perform higher level Karate and get a feel for how the class, the students and the Sensei (teacher) interact. Although respect plays a major role in our club etiquette, you will notice that the relationship between students and Sensei is built on trust and friendship, not overly formal discipline. All you need to do is turn up at one of our training sessions. Shorts and t-shirt are fine for your first few lessons. 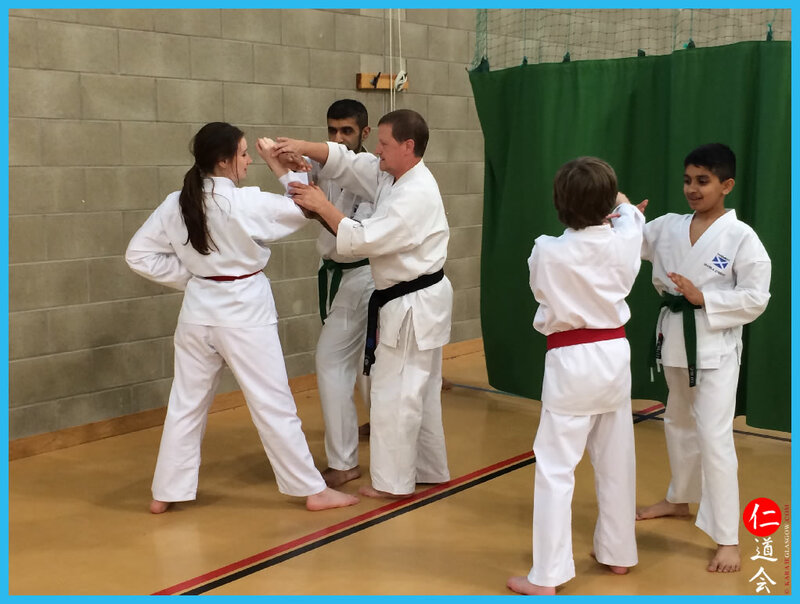 One of the senior grade students will make sure that you are introduced to the Sensei and will ask you a few questions about any martial arts history you may have (most new students don't have any!) as well as your general fitness levels. You can then take part in the class. Of course, every new student feels slightly self conscious the first few times that they train, being unfamiliar with terminology, the movement and the physicality of the techniques themselves. This is completely natural and every one of our students will identify with how tricky things can feel in the beginning. The Senseis are very appreciative of the efforts from every novice training with us and offer huge encouragement during the class. New students will often have a senior grade training alongside them during the first few classes also, to help keep things at a sensible and realistic pace. At the end of the class the Sensei will get your feedback on how the class went and discuss how our classes work in more detail, and answer any questions you might have. You do not need to order a Karate suit (Gi) until you are sure that you wish to continue on as a student long-term. For information on classes for all ages please contact us.